James Morgan (b. 1986) is a multi award-winning photojournalist and filmmaker. He is based in London but works mostly across Asia, Africa and South America, shooting in depth features and advocacy campaigns for the WWF, BBC, Sunday Times, New York Times, Guardian, USAID and many others. 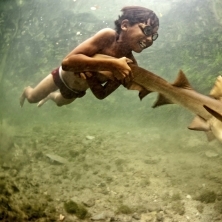 James’ forward thinking approach to the production and dissemination of multimedia features began with his work on Indonesia’s last sea nomads, the images won numerous awards and continue to be published and exhibited around the world. Recent work has included an investigative report looking at the links between international terrorism and the illegal wildlife trade, a behind the scenes look at an election race in Papua New Guinea and a group of indigenous female wrestlers fighting back against discrimination in Bolivia. Having travelled to over sixty countries, James is comfortable working in any environment and can speak English, Malaysian, Spanish, Icelandic and Indonesian. James is an ambassador for underwater housing manufacturer Aquatech, is represented by both Panos Pictures and Getty Images in London and is an Associate Fellow of the International League of Conservation Photographers.